Hello, my beautiful curly friends. 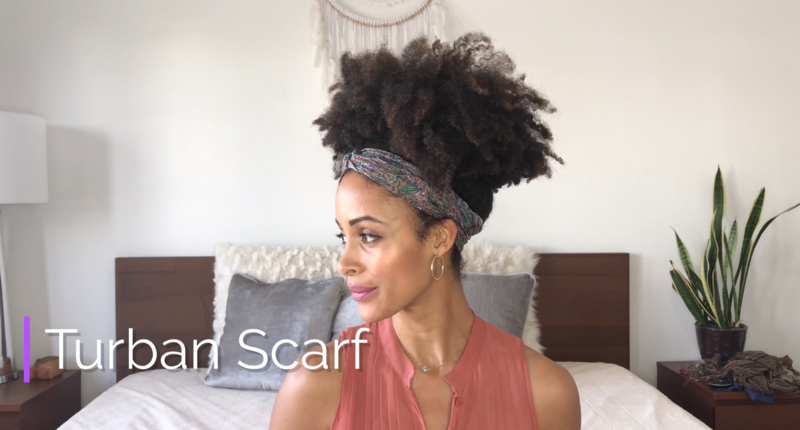 It's Keziah here and today I'm going to be sharing with you six hairstyles that you can do with the head scarf. Now these styles are going to come in so handy. I think they're perfect for last minute styles. If you don't have time to do your hair, they're great for vacation. If you're swimming, you're getting into pools are getting into the ocean and again, you don't have time to do your hair and spend, you know, the two hours it takes. I often wear my scarf during any type of vacation and it comes in so handy as I'm going from the pool and going out and just having a blast. So I can't wait to share these with you! I think you're going to absolutely love these. So let's just get right into them! All right, so I'm starting off with a really long scarf. This is actually a scarf I would say for your neck. It's something that you would probably tie around and wear around your neck or something like that. A friend gave it to me, but it's been one of my favorite scarfs. So it's not a traditional head scarf size. So any scarf can work for this. Whatever you have just pulled that out to do the styles. For the first style, I'm going to use my head scarf and I'm also going to use some hair ties. And I have my Snappee Hair Ties right here. I'm just snapping them together so you can see that they resemble regular hair ties. But what I'm gonna do is I'm going an unsnapped them to put my hair up so any hair tie can work for this just to pull your hair up. And so once I get it up into a puff, then I'm going to go ahead and take my scarf and I'm just going to bunch it up in the middle. I'm going to put it behind my hair, bring it up, then I'm going to tie a knot in the middle and pull it down. And then it may go in and tie a second, not so I'm double knotting this. And then I'm going to move with the scarf to wrap it around the back and then tie it. Another knot here and then I'm going to take the loose pieces and go ahead and tuck them in there it is kind of tuck into the scarf so that you don't see them. And then I'm just going to adjust the scarf so that it has even thickness on both sides and any of my hairs in the front that are coming out. I'm going to stick them in there underneath the scarf. I'm just going to go in and tuck any pieces that I can't seem to tie, which is such a great thing about scars is that really it's tying and tucking that create the style and then I'll go in and adjust any hairs that are sticking out by just tucking them underneath and that style. And this is style number two! It's like a band with a little bow or you can call it just a little button. Super cute, super easy to style and we really just dress out anything you're wearing. This is style number three. You're going to take your scarf and you're going to fold it in half and then you want to make sure the open side is going to be towards the back of your hair and you're going to put it on your head and you're going to pull your hair down and any hair that may come off on the sides, you can leave it out if you like or you can tuck it in. Either is fine. I will leave out a little bit of these hairs just to show you how it would look if you were to do that and then you're going to just release the hair that's in the back that you, you've been holding down and then you're going to go ahead and tie a knot in the back. So the same as we were doing with all the other hairstyles. Let me just going to tie it there it and then turn around and then I'm going to hold it down here while I just kind of adjust and gather more of my hair inside of the scarf and adjust like the way that I want my hair is to lay over my ears before I really go in and settle this style. So to settle it and you're just going to go in and tie a bow and the reason why I like the bow is that it's going to be really easy to take out at the end that you won't have to mess around with the knots and it being really tight and pulling, you know maybe your hair and then you let the sides go right here and you're just kind of adjust your hair. Keeping it over your ears I think really is what brings us style out and fluff out any extra hairs if you need to. And there you go. This is a style number three! Okay it up in the front, going to cross it at the top and tie a knot. It doesn't matter where you can do it on the side in the middle and then you're going to tie a second not just to secure it so that it doesn't fall off or come loose. And these knots, you want them to be really mellow. You don't really want to see them for the style, then you're going to go ahead and twist this end and then you're going to twist it all the way down and then tuck it underneath at the end. And then the same thing for the other side. You're going to twist it all the way down and then tuck it underneath on the site. I just tucked it there and I'm also taking out any of the hairs that may have come out during the process. And this part right here, you're going to tuck it under the scarf, this little flap, you're going to pull it over it to create a closure. Now cross it at the top and tie a knot. It doesn't matter where you can do it on the side in the middle and then you're going to tie a second not just to secure it so that it doesn't fall off or come loose. And these knots, you want them to be really mellow. You don't really want to see them for the style, then you're going to go ahead and twist this end and then you're going to twist it all the way down and then Tuck it underneath at the end. And then the same thing for the other side. You're going to twist it all the way down and then Tuck it underneath on the side. I just tucked it there and I'm also taking out any of the hairs that may have come out during the process. Sometimes it might stick up like this, but what you can do, you can then grab, pull it forward, and then go ahead and begin to tuck it tight and tuck again. I really love wearing the scarves because they're so easy and you can't really mess them up because if anything kind of comes out, you just tuck it. It's really awesome. And this is style number four! All right, this is style number five. You're going to take your scarf and you're going to put it on the back of your hair, and then you want to cut your hair with it. Bring the two ends and front, and then you're going to tuck in any hairs that are sticking out. And then you're just going to walk it up your neck so that it meets your hairline right here. And then once you've done that, then you're going to pull your hair and the top and from the middle out a bit more. And then you're going to tie a knot in the front. And then after you had tied a knot in the front, you want to make sure that it's over your ears if that's comfortable for you. If it's not, you can totally pull your ears out. I'll just show you how that might look. Your ears are a little bit more obvious, but, um, it still looks great. I like to keep it over my ears. I actually liked the feeling of having my ears tucked. It feels really nice. Now you're gonna take this and you're going to twist it at the back, which I've already done. Tie a little knot and then you're going to bring it in the front. Tie another little knot and then just tuck it. And if you don't really have any more to tie in the front, that's totally okay. You can just tuck it in the back. So I have this hair coming out. I want to show a little bit more hair. So I'm going to take this top part and I'm going to roll it down to show a little bit more of my hair. I like it to have a little bit more of a puff and you can also just pull your hair out now. This one came out. So we'll just tuck it again. Now I also want to grab my hair a little tighter here. So that's where I'm going to take my Snappee's and snap them together. I'm going to put it around, pull it and just see how it comes together more and then snap it in the back volia. I definitely feel like a queen in the style. It's so awesome. I love it. And this is style number six. Our last style, you're going to take your scarf and you're going to put it over the side of your hair and then you're going to pull it together on the side. So you can choose whatever side looks best for you or maybe your favorite side. And then you're going to tie a knot at the friends this and again, any hairs that come through, just go and tuck them and tie a knot. And then you're going to take these and you're going to pull them to the back. So these are the ends. And then you're going to tie another knot in the back. And then I'm going to tie a double knot so that we secure it because I know I only have a little bit left of the scar, so let's make it secure. While I can, and then you're going to bring this in the front, tuck it in. And then bring the other end and tuck it in in the front. So you got to get good at tucking and timing when it comes to a scar. Then I'm going to do what I did in the previous style. I'm going to roll down the fabric to let a little bit more of my hair come out and create a puff. A lot more in the front I like. Let's tuck this again, comes out, and then I'm gonna pull this back cause I just want a little bit more of my hair to show. I'm going to cover a little bit more of my ears. Here we go. This style number six. It's like a side puff with the scarf. Thank you so much for tuning into this video. I'm so happy to show these styles with you that you can do easily with a scarf. If there's any other styles that you'd like to see, go ahead and comment below. If you like these hairstyles and also subscribe if you haven't to my channel. I'm so happy to do the styles for you and thank you so much for tuning in and I'll see you next time!